Marjorie Johnson, Colin Hanlon, Libya V. Pugh and Sharon Washington in Dot. Photo by Carol Rosegg. BOTTOM LINE: A funny yet serious new play about a family's struggle with their mother's descent into dementia. Susan Stroman directs this tragi-comedy about the struggle to cope with an aging mother’s descent into dementia—yes, that Susan Stroman—the legendary choreographer/director of such hits as The Producers and Crazy for You. 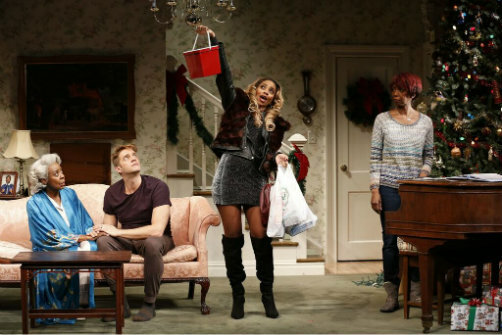 Stroman is branching out with this non-musical about three distinct characters forced to face the fact that their mother “won’t ever be alright again” and “[t]hat is [their] new normal.” She effectively gives this tragic but funny play all of the color, sparkle, and shine that you expect from her musicals. Playwright Colman Domingo even gives Stroman the opportunity to include one spectacular dance routine between mother and son, and her choreography will thrill you as usual. To be sure, this entire ensemble, led by Marjorie Johnson in the title role, is sensational. Each is fully committed to the material and rooting for the play to work. Their dedication pays off for Domingo, whose script is weighed down by a few plausibility issues that the audience seemed happy to overlook because the performances were so engaging. The sets, by Allen Moyer, are likewise outstanding. Moyer designs two very elaborate rooms in this beautiful middle-class home, which gives this production a polished finish that only plays produced on the highest level enjoy. The beauty of the set design, however, brings us back to the plausibility issues. The patriarch of the family, a physician, is described as a broken man whose “drinking got in the way of his practice.” Yet nothing about this home suggests that anything is broken. This is the home of a well-respected and accomplished doctor, who may have had too many drinks on a Saturday night, but not someone who threw away his career for the bottle. Jackie, the girl next door, is Jewish, yet this seems to be news to her best friends who are now in their 40s. Finally, Donnie, who hasn’t played the piano in years and questions whether he still can, suddenly plays Christmas songs with a flare worthy of Michael Feinstein. One can certainly overlook these contradictions. Domingo’s script is wonderfully detailed and every character is meticulously defined. However, the details are delivered through dialogue, and we sometimes don't evidence for what the characters claim to be true. Be that as it may, no expense is spared on this production. The performances are colorful and fun to watch and the script is filled with hilarious one-liners. If you’re already nostalgic for the holiday season, you have the opportunity to celebrate Christmas all over again with a tight-knit family whose members love each other very much and who deal with life’s real problems with a healthy dose of humor. Dot is written by Colman Domingo and directed by Susan Stroman. Set Design is by Allen Moyer. Costume Design is by Kara Harmon. Lighting Design is by Ben Stanton. Sound Design is by Tom Morse. Hair and Makeup Design is by Dave Bova. Stage Manager is Roy Harris. The cast includes Colin Hanlon, Marjorie Johnson, Stephen Conrad Moore, Libya V. Pugh, Michael Rosen, Finnerty Steeves, and Sharon Washington.